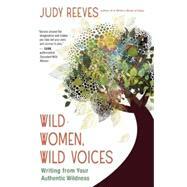 In her years as a writing coach, Judy Reeves has found twin urges in women: they yearn to reclaim a true nature that resides below the surface of daily life and to give it voice. The longing to express this wild, authentic nature is what informs Reeves’s most popular workshop and now this workshop in a book. Here, you will explore the stages that make up your life, from wild child, daughter/sister/mother, and loves and lovers, to creative work, friendships, and how the wise woman encounters death. Both intuitive and practical, Wild Women, Wild Voices responds to women’s deep need for expression with specific and inspiring activities, exercises, and writing prompts. With true empathy, Reeves invites, instructs, and celebrates the authentic expression — even the howl — of the wild in every woman. Judy Reeves, the author of A Writer’s Book of Days, has edited anthologies including the Brown Bag Anthology. A member of Second Story Writers, and cofounder of the nonprofit The Writing Center, Reeves lives in San Diego, CA.